Becoming a caregiver for your loved one can be tough and stressful, and it doesn’t always happen by choice. Each year, thousands of people make the conscious decision to provide crucial living assistance for their friends, family members or spouses. Countless others are thrust into caregiver roles when loved ones are stricken by injuries, illnesses or disabilities. For some, providing care is as easy as helping out with chores around the house. For others, being a caregiver is literally a full-time job in addition to what you are already doing. There will be times when you need to take a break from caring for your loved one. Golden Heart Senior Care provides you with that much needed rest. We have short-term care programs available to give you the time you need to step away and rejuvenate. Whether you need us for a few days or a few months, we can provide respite care until you are ready to step back into the caregiver role. Also, just having someone you trust come in for a few hours, two or three times during the week can give you that much-needed “down time” to run errands, relax, or even enjoy a social outing. 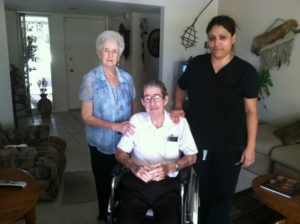 Golden Heart’s professional caregivers will be there for you and your loved one!